Microsoft has jumped into the free, self-service data analysis space with Power BI. 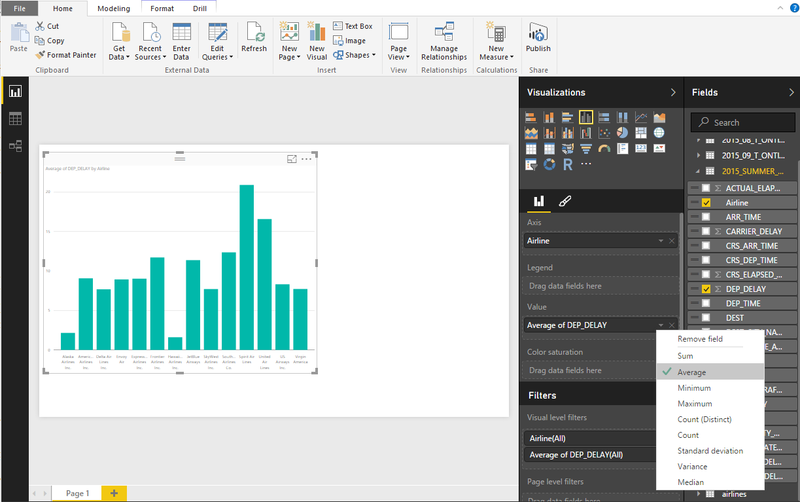 Power BI offers basic data wrangling capabilities similar to Excel's Power Query. It also lets you create interactive visualizations, reports and dashboards with a few clicks or drag-and-drops; type natural-language questions about your data on a dashboard; and handle files that are too large for Excel. It can work with dozens of data types -- not only Excel, Access and CSV files, but also Salesforce, Google Analytics, MailChimp, GitHub, QuickBooks Online and dozens of others. And, it will run R scripts -- meaning that any data you can pull in and massage via R you can import into Power BI. What is Power BI exactly? Power BI includes both a downloadable desktop program and a cloud service, each of which offers different but overlapping capabilities. Data wrangling is desktop-only; visualizations and reports can be created in either; dashboards and report sharing are cloud-only. In addition, there are mobile apps for iOS, Android and Windows that let you view your Power BI or SQL Server Reporting Services (SSRS) reports and dashboards. At least for now, you can take advantage of most Power BI capabilities without paying -- although Microsoft is clearly betting that you'll like the basic cloud service enough to spring for a $9.99/month paid account. Chief benefits of the paid account are increased data storage (10GB vs. 1GB), more timely automated data refreshes, the ability to create enterprise "content packs" and higher streaming capacity. Be advised, though, that Microsoft wants a business email address when you sign up for Power BI cloud service -- while it can't screen out all non-commercial addresses, it won't accept known free consumer addresses like Gmail.com. Accounts from .gov and .mil addresses aren't supported for direct sign-up at powerbi.com either, although addresses at .edu and .org are. And if you'd like to use any of Power BI's free mobile apps, you'll need a Power BI cloud account or access to your organization's SQL Server. On the other hand, Power BI Desktop (at least for now) is not only free but doesn't require an account, an email address or a credit card -- just a Windows PC. If you'd like to learn how to use this new, still-evolving tool to create reports and dashboards, read on. 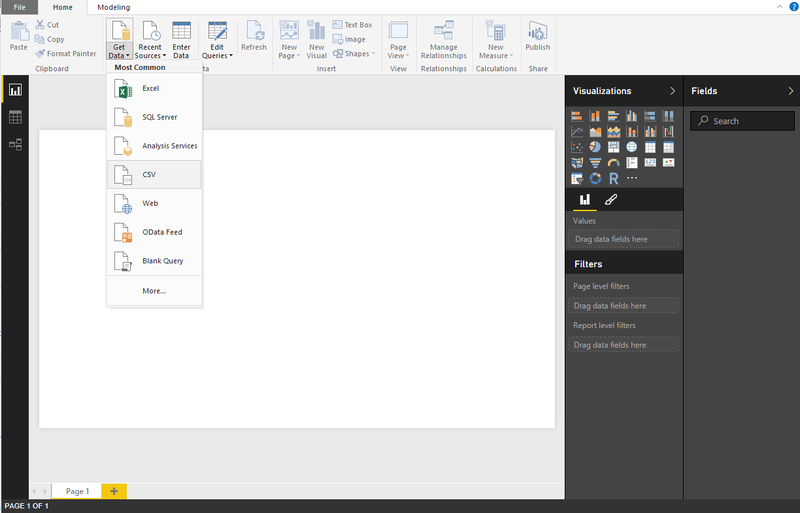 If you're used to Excel, you might think that selecting File > Open is the way to start analyzing your data in Power BI. But you'd be wrong -- File > Open is only for an already existing Power BI project. Instead, to import new data, click the Get Data button on the Home tab, choose your data source type and click Connect. To load a file, go to Get Data and select your data type. This will bring up a familiar Windows file-selection dialog. Choose your file and you'll see a preview of your data. If it looks okay and there's nothing more you want to do to the data before starting to graph and chart, hit Load. Otherwise, click Edit, which brings up the Power BI Query Editor. In this article, I'm going to use monthly files of airline flight-delay information from last summer that I downloaded from the Federal Aviation Administration (FAA) website. I know -- especially where airlines are concerned, past performance is no guarantee of future results. But if you're going to book a flight this summer, it might be fun (if not necessarily predictive) to answer questions such as: Which airlines had the best and worst delays last summer? Are there any specific flights that do especially poorly or well? 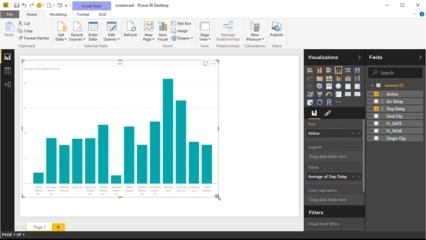 These Power BI charts can help you easily answer these questions. If you want to follow along, you can download your own data files from the Department of Transportation website. Or if you want, you can download the same files I'm using here -- the file download is available to all members of the Computerworld Insider program; registration is free, so if you're not already an Insider, it's easy enough to sign up. Files include data for domestic flights in the U.S. by month (so if you want to check flights to Paris, this won't help). There are separate files for June, July, August and September. 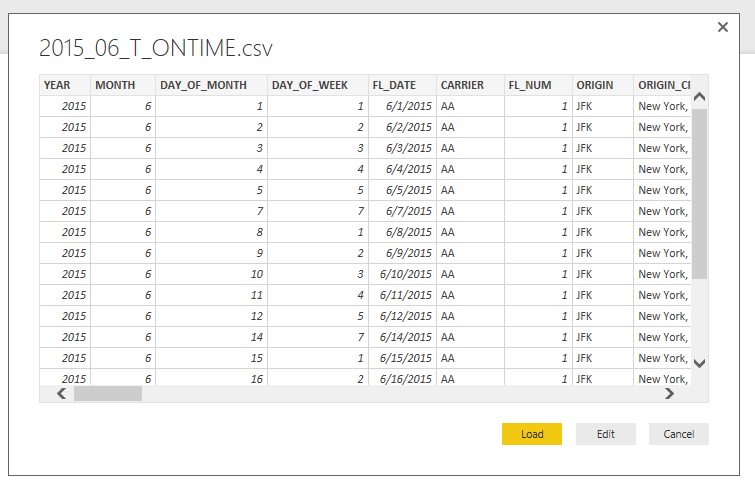 Start by loading in the June file (2015_06_ONTIME.csv): Go to Get Data > CSV in Power BI. Select and open your file, and you'll see a preview of your data. Then click Edit (not Load) to bring up the Query Editor. Now we can do some data wrangling. One thing that can be useful to check at this point is whether number columns are loading in as numeric (aligned to the right) or text (aligned to the left). In other words, if you see numbers that are flush left in your data preview, they're not importing correctly -- which is one reason to choose Edit and bring up the Query Editor window even if you don't think you need to make changes in your data's structure. Make sure that the number columns are loading in as numeric -- in other words, aligned to the right. Once in the Query Editor, you can right-click on a column header and select "Change Type" in order to manually select a data type such as whole number, decimal number, date, date/time, etc. But there's plenty more we can do with this data besides checking column types. Once in the Query Editor, you can start tweaking your data. 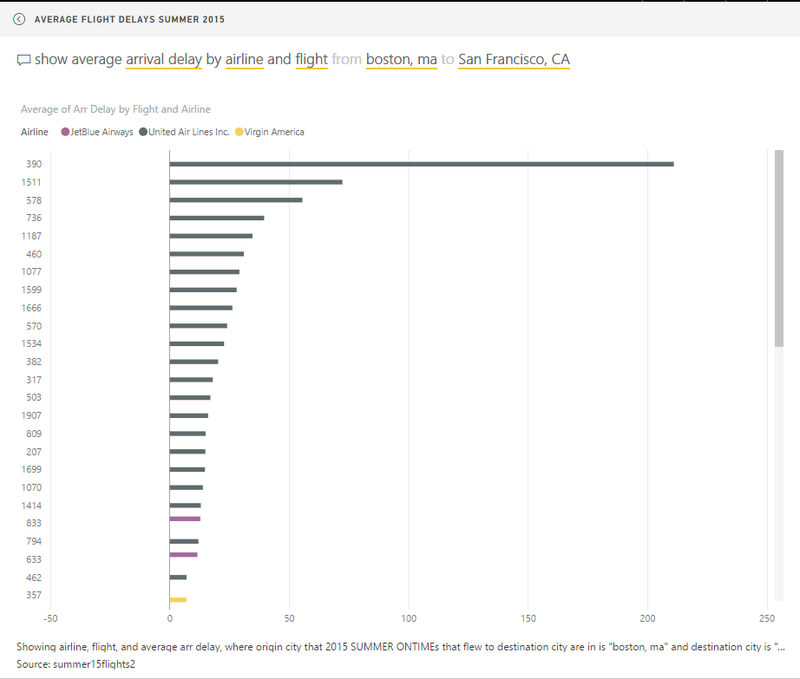 Note: If you're not interested in data wrangling and want to get started with charts and graphs, load the summer15delays.csv file instead and skip ahead to the Easy visualizations section -- but do make sure that the flight number is changed from numeric to text when you import the file. It can be confusing for beginners to understand when to use Power BI's desktop software and when to use the Power BI cloud service, since they do some but not all of the same things. To begin with, the desktop application runs only on Windows. The cloud service is multi-platform, running on Microsoft Edge, Internet Explorer, Chrome, Safari for Mac and Firefox. In addition, mobile apps are available for iOS, Android and Windows 10 for viewing your reports and dashboards. The desktop app is designed for authoring. It's where you can do data modeling, merging different data sources and so on as well as visualization. The Power BI cloud service is for sharing and creating dashboards. It's also where you can access features like natural-language questions ("Hey Cortana...."). Cortana natural-language technology is getting baked into Power BI cloud. You can build visualizations and reports in the service, too, but you can wrangle data only in the desktop app. If you need to massage your data for analysis -- combine data sources, add or delete columns, or reshape tables -- you'll want to use the desktop software, since it's the only option for data modeling. 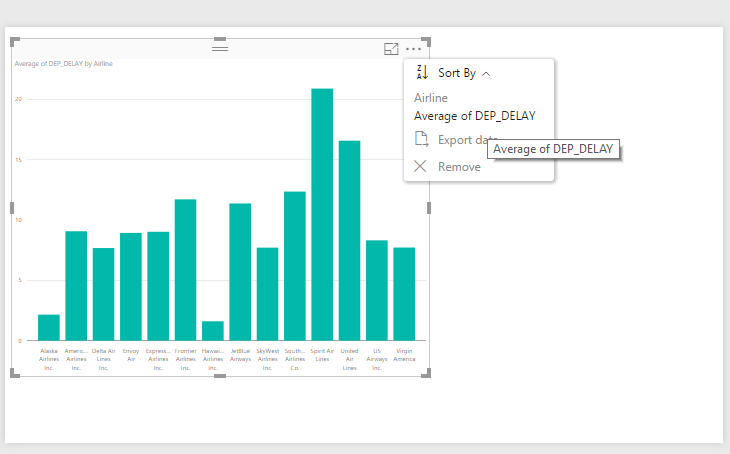 To create dashboards -- visual summaries of data from one or more different sources -- and ask natural-language questions about data on those dashboards, you need the Power BI cloud service. To get some rudimentary automated analysis (Quick Insights) from your data, you need the cloud service. To share your analysis with others, you need the cloud service. Some online data sources, such as Adobe Analytics, require using the cloud service. You can start off working in Power BI desktop if you need its data-wrangling capabilities and then publish your data or report to your cloud account to create dashboards and share your work. Query Editor lets you reshape and transform data by, for example, merging multiple data sources and pivoting or unpivoting data. It can also handle common data drudgery like adding, deleting, renaming and moving columns. For the flight-delay data, you want to combine multiple months into a single table, so don't start changing data within June until you've added July, August and September. Otherwise, you'd have to repeat the same transformations on each file before combining them. To import more CSV files into this active Query Editor window, click on New Source > CSV and choose a file (you can select only one at a time), give the data preview a quick look and click OK.
Each data source should now be listed under Queries in the left panel. 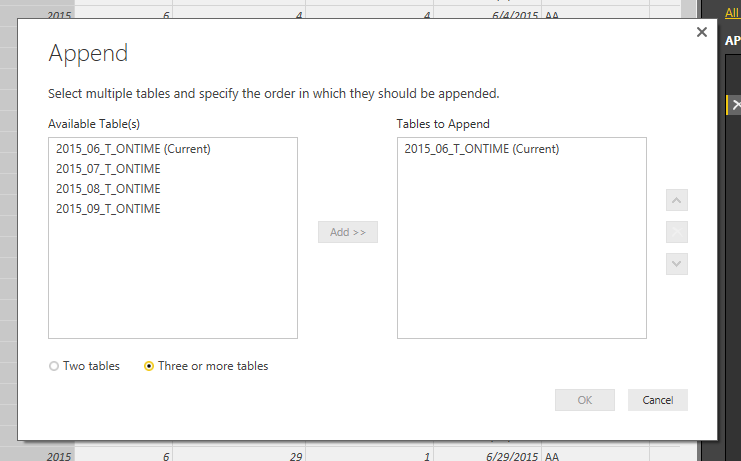 Next, in the Queries panel, click on the table that you want to add data to (for this example, you can choose 2015_06_ONTIME and add other months to that). Click Append Queries (if your browser window is narrow, Append Queries may be under a Combine button), click on Three or more tables (the default is two tables) and follow the instructions in the dialog box. Append Queries lets you combine data sources. Your 2015_06_ONTIME file should now have four months of data, not just June, so it's probably worth renaming it to something like 2015_SUMMER_ONTIME. You can right-click on it in the left-side Queries panel to rename it; or, with that query active (clicked on from the Queries panel), look at the Query Settings on the right panel and change text in the Name box under PROPERTIES. Next, let's try merging two tables using a common column -- what's often called a join in SQL or using a lookup table in Excel. The CARRIER column in 2015_06_ONTIME uses airline codes (such as AA) instead of airline names. It would be nice to have the complete airline names available since not all codes are intuitive -- AA may be obvious, but VX and B6 less so. I created a file of airline codes and carrier names, airlinecodes.csv, that's also available in the Computerworld Insider data download. You can import the file into the current Query Editor window using the New Source button. 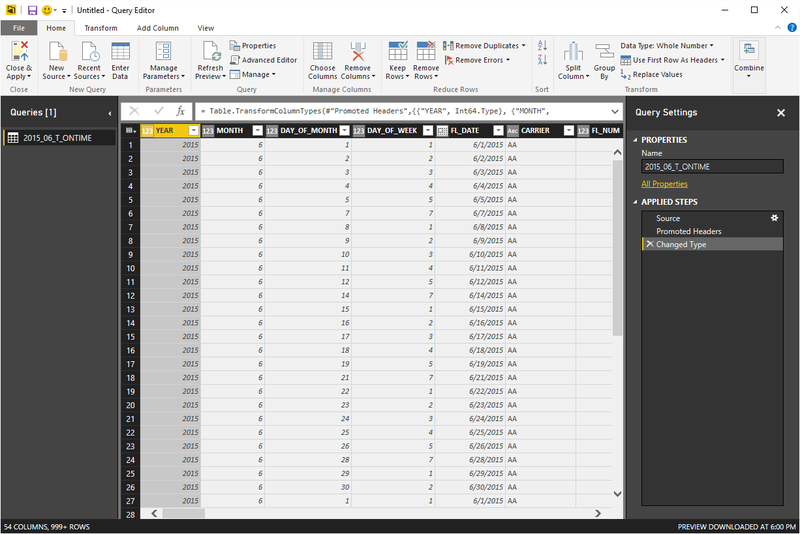 On my system, airlinecodes.csv imported into Power BI without the correct column names. Instead, the columns were named "Column1" and "Column2" (obviously the system defaults) while the real column names, "Code" and "Airline," showed up as the first row of data. If that happens to you as well, look to the right on the Home ribbon and you should see an option to Use First Row As Headers. Click on that to fix it. Next, let's add airline name information to the flight-delay data. 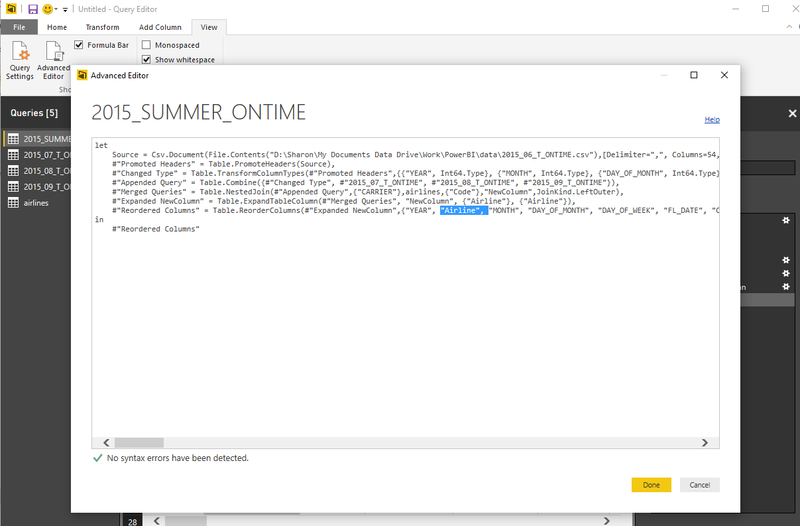 With your main data source 2015_SUMMER_ONTIME active, select Merge Queries. In the dialog box that pops up, choose the query table with lookup information, in this case airlinecodes, and then click on the column header for the common column in each table: CARRIER in 2015_SUMMER_ONTIME and Code in the airlinecodes table. Finally, choose what kind of merge/join you want -- they're described in the drop-down list. For example, the one we want, "Left Outer," means "Keep all rows from the first table whether or not there's a match in the second table." Power BI will now attempt to estimate how many matching rows there are, which is helpful if you've made a mistake and end up with zero matches and thus need to re-examine which columns you're using for the join and whether the data is formatted the same in both. Everything good? Click OK and the join is done. After the merge, you'll see a column on the far right of your data table labeled NewColumn, with a table icon to the left of the column name and arrows to the right. Click the arrows to expand that table column to view the data -- you can choose the columns you want to add to the original table. Expand the table column to view the data. If you want to move that Airline column closer to Carrier, head to the Transform tab. There you'll have the choice to move the new (or any other) column. 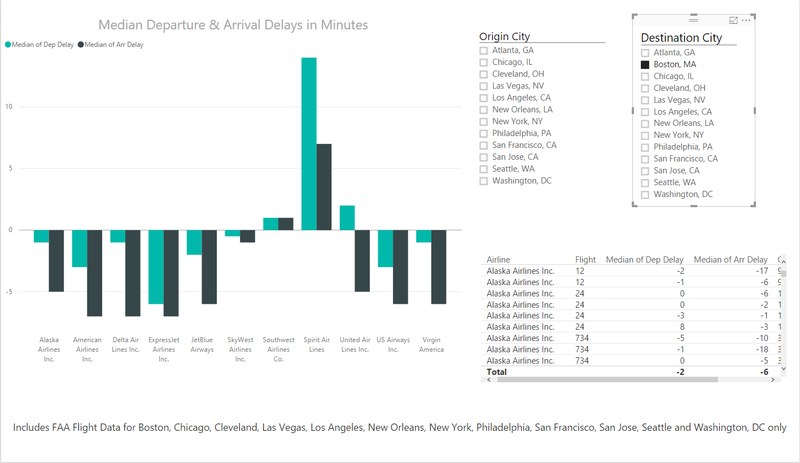 In this case, using the Power BI interface, you can select the new column and then use the Move > To Beginning and then Move > Right four times in order to get the Airline column next to the Carrier column. But there's a less cumbersome way. The Transform ribbon has a number of options including moving a column. First, if you don't see a formula bar above your table, go to the View ribbon and check Formula Bar so it's visible. Then head to the Transform ribbon, make sure the Airline column is selected, and choose Move > To Beginning. You'll now see a formula in the M language that reorders the columns. Click Move > Right and you'll see how the formula changes. It looks like you could just cut and paste the Airline column where you want it to go -- but you can't make changes here. Check the Formula bar under the View ribbon in order to see underlying M language scripts. Instead, go to View > Advanced Editor and you'll see all your steps as a script. Edit the Table.ReorderColumns line to put Airline when you want it, and click Done. Your Airline column should have moved. Edit the Table.ReorderColumns line to put Airline when you want it. There are a number of other operations available on the Transform menu as well, such as grouping values by one or more columns, splitting columns based on a separator or specific number of characters, and pivoting (similar to creating Excel pivot tables) or unpivoting (moving multiple columns of data into two columns: variable data, such as "Month" and value data, such as "June"). You can also do some basic statistical exploration using options on the Transform ribbon, such as counting rows or creating summary stats like count, average, median and standard deviation. When you perform a data summary, a table with the new summarized values will appear in place of your original data table. To get the view of your original data back, go to the Applied Steps column to the right of your data table and delete the summarizing function. In fact, you can use Applied Steps to delete any step you've taken here, not just the most recent, which is rather handy. Unfortunately, there's not also an Undo after deleting a step in the Query Editor, so you can't bring something back that you've erased. Select the Count Rows menu option on the Transform ribbon to see the number of rows; if you're using flight-delay files downloaded from Computerworld, you'll see there are slightly over two million rows -- more than you could pull into Excel and its limit of 1,048,576 rows. Delete the Count Rows step to return to the full data. Right now there are over 50 columns in the summer flight-delay table. To make things more manageable, select just a few that you might want to use in some data visualizations: MONTH, FL_DATE, Airline, FL_NUM, ORIGIN, ORIGIN_CITY_NAME, DEST, DEST_CITY_NAME, CRS_DEP_TIME, DEP_DELAY, ARR_DELAY, CANCELLED, CARRIER_DELAY, WEATHER_DELAY, NAS_DELAY, SECURITY_DELAY, LATE_AIRCRAFT_DELAY. Click the Choose Columns button on the Home ribbon, deselect Select All Columns and then check the boxes next to the columns you want to keep and click OK. If you later decide you want to add back any column, you can return to the Query Editor by clicking Edit Queries and then click the settings gear next to Removed Other Columns in the Applied Steps column. That brings the dialog box back up with your prior selections, and you can add more columns to your project. Finally, make sure to change columns that don't make sense as numbers into text. 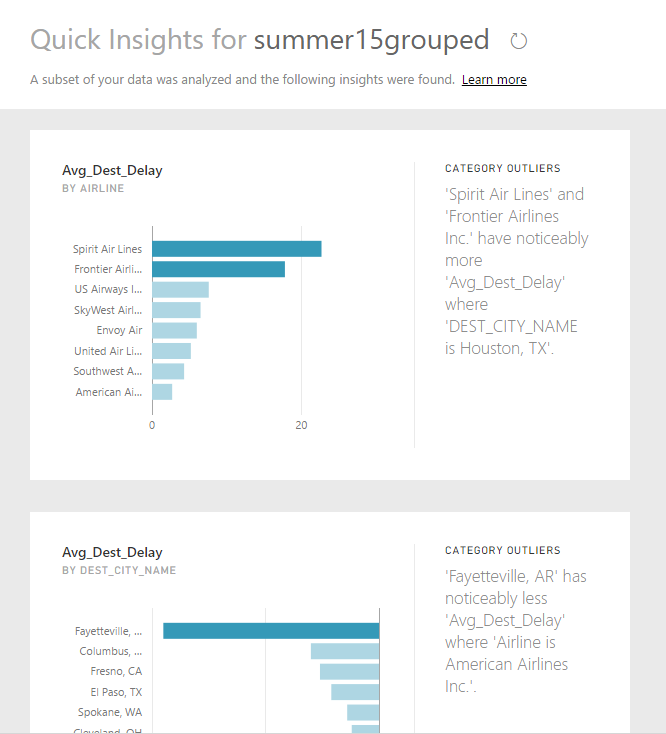 For example, unless you want Power BI to calculate sums of your flight numbers -- and you don't -- turn them into text. Otherwise, attempting to make graphs with these fields as categories won't work, and you'll end up wasting a fair amount of time (don't ask me how I know). You can convert FL_NUM and MONTH into text by right-clicking the column header and choosing Change Type > Text. Another tweak: The CANCELLED column shows 0 for false and 1 for true -- if you want, you can change that type to True/False. 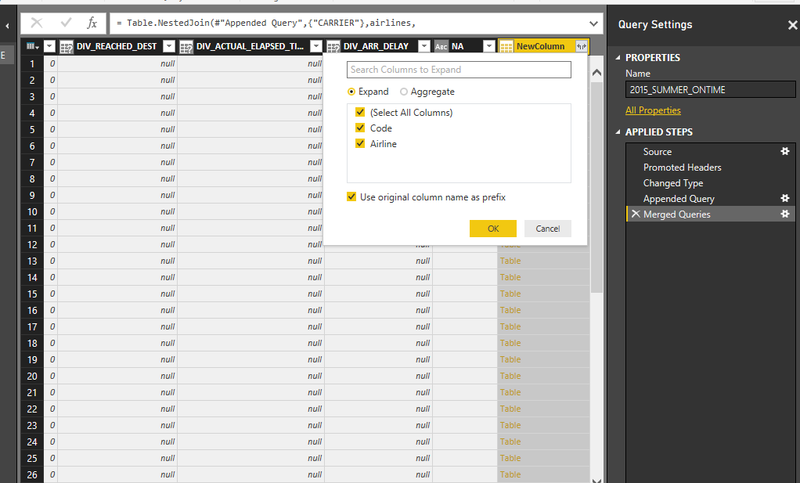 Close out of the Query Editor with Close & Apply to get back to the main Power BI application. (Because these files are so large, this may take a little while.) At this point you might also want to do a File > Save to save your work as a Power BI project so that if something happens, you won't need to re-create your steps. 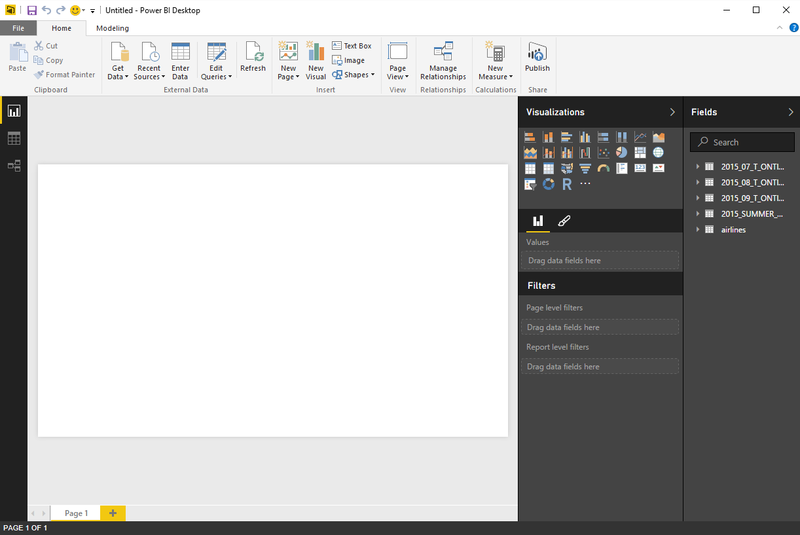 A Power BI blank canvas. It would be nice to get rid of all the other query files that we merged into 2015_SUMMER_ONTIME, since we won't be using them again. If you go to the Fields panel on the right and try to right-click and choose Delete, you'll get a warning that you can't delete those queries because they're referenced by another query. However, you can right-click and then Hide them to get them out of the way. 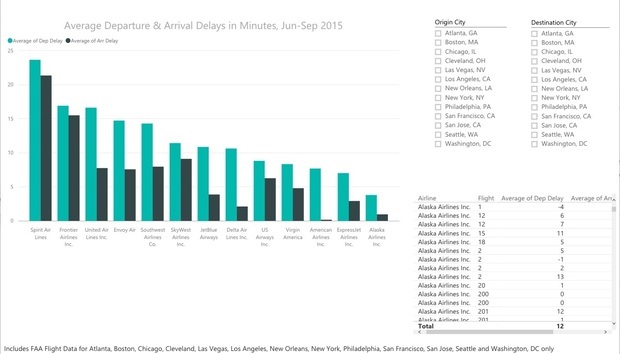 Want to graph departure delays? Click the check box next to DEP_DELAY. You'll get a bar graph with one bar summing all the delay time in your data. (Power BI tries to guess what visualization will work best with your data if you don't specify.) Click Airline, and the graph will morph into a bar graph of each airline's total flight delays. A sum of total delays by airline isn't that useful, though; the more flights an airline has, the more minutes delayed it's likely to have. But if you look under the Visualizations panel and find DEP_DELAY under Value, you can click the triangle drop-down menu and change the Sum of DEP_DELAY minutes to Average (or Median, if you prefer). Clicking the triangle next to a Value field brings up visualization options, such as changing Sum to Average. The graph is currently sorted by airline alphabetically. If you want it sorted from highest to lowest, click the ellipsis at the top right and choose Sort By > Average of DEP_DELAY. Clicking the ellipsis at the top right of a graph brings up sorting options. A graph showing departure and arrival delays. The default title is a little lame. You can change the title and a lot of design defaults by clicking the brush icon just below the Visualizations options. To edit a specific graph, make sure you click it so it's active (the bounding box is visible). Click on Title and you'll see options to change the title text, font color, size, alignment and so on. There are also options to add data labels to the bars, change the X- and Y-axes, and more. For example, you can change the title to Average Departure & Arrival Delays in Minutes, Jun - Sep 2015, bump up the text size and center-align. If you want to rename fields, you can do that on the Fields panel -- right-click a field and choose rename. Try changing DEP_DELAY to Dep Delay and ARR_DELAY to Arr Delay. Well, it sure looks like Spirit Airlines wasn't the best choice last summer -- but maybe the airline has big delays in some airports but not others? We can revise the visualization to include just a few airports. There are a couple of ways to narrow in on a subset of data. Filters can apply to one graph, the entire page or all pages in a multi-page report. You can change filters while editing a report; but if you subsequently share your work as a Power BI dashboard, read-only users will see only what you filtered and won't be able to add data back in. Another choice is to add an interactive slicer. With slicers, if you later share your work with others, they can interactively filter data and add it back in. Power BI has two different "gateways" that allow you to automatically refresh data from local data sources: personal and enterprise. If you'd like to automatically refresh local files residing on your system, you can use the personal gateway. It requires a paid Power BI Pro account and 64-bit Windows on your PC. For scheduled data refreshes, your system needs to be on and not asleep for the refresh to take place. As you might imagine, the enterprise gateway is designed to be installed on a server (although it can also be installed locally) and, like personal, requires a Power BI Pro account. With the enterprise version, IT professionals can manage access for multiple accounts. To automatically update data that's elsewhere in your organization, such as an in-house database server, you can use either the personal gateway or the enterprise gateway. If you want to refresh data from an R source, you currently need the personal gateway, although adding that capability to the enterprise gateway is on Microsoft's roadmap. Note that if you're connecting to an external online data source such as Salesforce, you don't need a gateway. The platform is being updated fairly frequently -- once a month for the Desktop, more often for the cloud service -- offering the promise of continued new features and functionality. 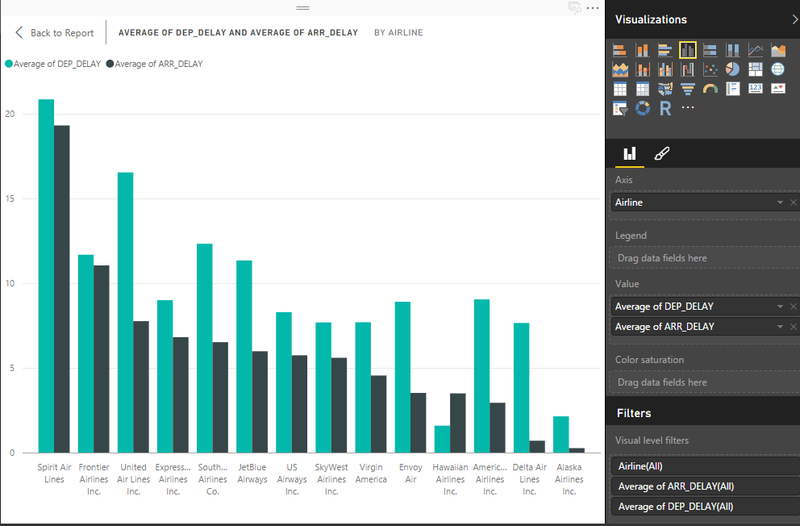 And as an R user, I'm intrigued by the integration of R scripts within the software and Microsoft's recent announcement R graphics in the Power BI service (Pro account needed) -- although you definitely don't need to know or use R for Power BI.